- from the commonwealth of Virginia, "Thief" Poirier !! - from the fairways & sand traps of Tuscon, AZ, Don Tringali !! - from the pure mountain air of Idaho, Lee Troxler !! - from the great state of Texas, Dan Godwin !! - Florida's favorite whipping boy, Ernie Marchosky !! - From the Inland Empire, Gary Schwary and the one & only Rees Evans !! These names above represent just a small sampling of those who have already RSVP'd for the event. For the complete list to date, click HERE. If you haven't done so already, get your RSVP in to John Morris so he can get an accurate count on attendance. 1) Spouses and/or significant others are welcome to attend as well. 3) No host bar ..... sorry Meador, that means you have to pay for your own booze. 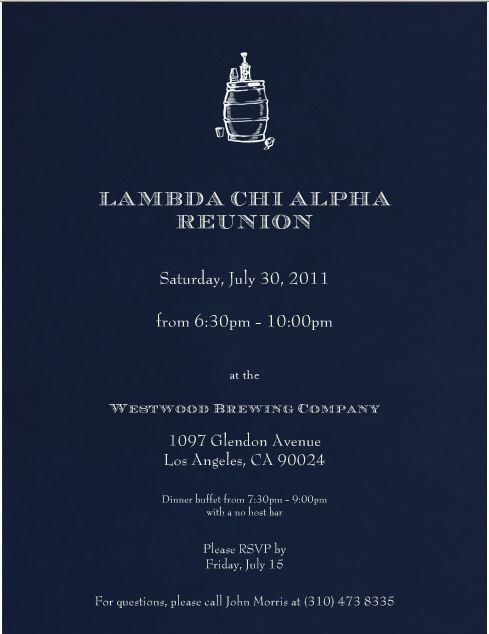 It looks like this is shaping up to be an amazing event, so spread the word amongst all the other Old Bro's to clear your calendars and get ready to party ..... hope to see you all there !! And a GREAT TIME was had by all ! !